Yumi Okazaki has earned both a Bachelor’s and Master’s degree from Tokyo National Arts University. In 1983, she passed the Hungarian national scholarship exam with the highest honors and studied at the National Liszt Academy of Music in Budapest. After completing her studies, she started her career as a concert pianist in Japan and in France. She also taught piano performance at Musashino Music University in Tokyo for seven years before resigning due to becoming fully occupied with her concerts. 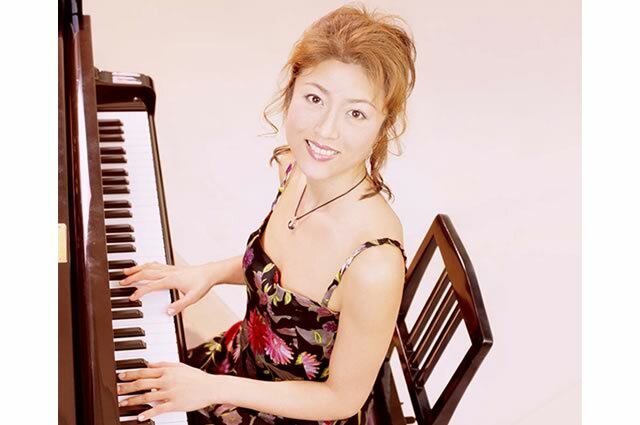 Yumi is the recipient of numerous awards, including the Ministry of Education “Minister’s Award.” In 1986, she won first prize in the piano section of Asahi Newspaper’s 5th Music Competition. Among her activities, Yumi performs “Concert for babies” for pregnant women, and “Concert for Kids” for newborns and young children. These unique concerts are popular throughout Japan. Yumi takes special care that her audiences learn to enjoy classical music as much as possible. In 2002, Yumi had another unique concert at which she performed “Lady Macbeth” as an actress while also playing piano on stage. A leading Kabuki actor Baigyoku Nakamura took Macbeth’s roll. The audience and critics raved about her new world of classic music concert. After the success of the “Lady Macbeth” play, Yumi started a new music stage play, “Gold Note” for children in which she acted and directed. The story is about mother and son who depart for the mysterious tour and find the miracle gold note. Lots of beautiful classic pieces are performed by piano and violin during this play. Yumi plays with an orchestra, a piano trio, or solo to always satisfy her audience. Her numerous recitals in Japan and overseas are very well received. She has been chosen as a pianist for world luxury brands such as Cartier, Van Cleef & Arpels, Piaget, Chiristian Dior, Chaumet and Grand Marinier because of her elegant style. In addition to activities as a pianist, Yumi has performed as a television host and radio personality, and has written a variety of essays. Her CDs “An evening of Walzes”,”Concert for babies”, “Berceuse”(Sony Records) and “The Goldnote Story” (Art Days) were released in Japan and are on sale. She has been an artist of Sony Music Artist,Inc. since 2003 and is a Sony Foundation of Education committee member. Recently Yumi spent 2 years in Washington (USA) studying music for fetuses and infants, American contemporary music, and Jazz performance and composition.